WOLVERHAMPTON boss Peter Adams praised the efforts of his patched-up side after registering their first away win of the season. 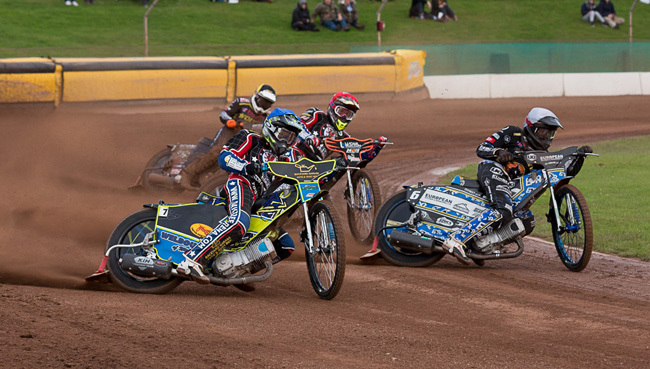 The Parrys International Wolves defeated Somerset 49-44 at The Oaktree Arena and moved to the top of the SGB Premiership standings in the process. With club No.1 Freddie Lindgren on Polish League duty and Sam Masters and Mark Riss fulfilling Championship commitments with Edinburgh, it was always going to be a battle for the Monmore men. But a solid team performance pulled them through as they made it four wins on the spin. Said Adams: "Somerset isn't an easy place to come to, especially when you've got a chunk of your own team missing, but our replacements in Richie Worrall, Robert Lambert and Ellis Perks did us proud and they supported our regular riders superbly. "This is Somerset's biggest home defeat so far this season which tells you a lot so we're certainly very happy. "We'll be even happier when we look at the league table tonight and see ourselves sitting at the top. "We're on a good run - but now the challenge is to keep that ball rolling for as long as we can!" Rory Schlein recovered from a last place in his first outing to reel off three straight wins before finishing behind Somerset man Josh Grajczonek in heat 15. Jacob Thorssell combined with Schlein for vital 5-1s in heats seven and ten on his way to eight points - a tally matched by guest duo Richie Worrall and Robert Lambert. Kyle Howarth continued his solid form at No.2 while Ellis Perks performed admirably as guest reserve. Nathan Greaves failed to score, but was never far off the pace around a fast Oaktree circuit. The Wolves will be looking to extend their winning run when they welcome the Rebels to Monmore Green on Monday. SOMERSET 44: Josh Grajczonek 15, Patrick Hougaard 10, Jan Graversen 7, Rohan Tungate 5, Jake Allen 4, Charles Wright 3+1, Paul Starke 0. WOLVERHAMPTON 49: Rory Schlein 11, Jacob Thorssell 8+3, Robert Lambert 8+1, Richie Worrall 8, Kyle Howarth 7+2, Ellis Perks 7, Nathan Greaves 0.